Golfy's Blog: This is most definitely NOT the age of the train. To start with, the state of the bleeding railways in our country are becoming a joke. Now I know the railways are a soft target. They've had years of neglect and very little investment - which is particularly strange when you consider the cost of fares that passengers blindly keep on paying like lambs on the way to slaughter. And it this that's really starting to "get my goat" - so to speak. And no, this is nothing to do with Virgin loosing out to First Group over the East coast mainline... I've never been anywhere near the thing. 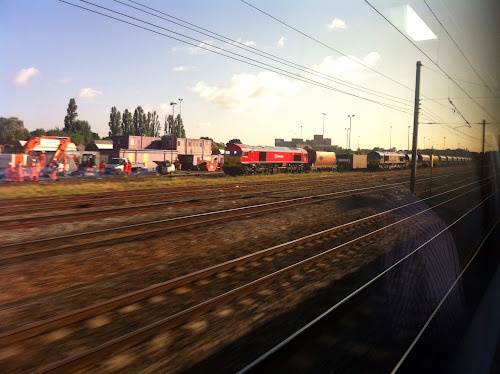 The railways are something that are close to my heart in a more recently discover sort of way. I've been making use of the "Ancestry.co.uk" app to do a bit of digging into family history, and it turns out that my great grandfathers (on both sides) regularly had comings and goings via Isambard's steam locomotives and the Bristol to London route. Indeed one of them was an engineer and responsible for all manner of coal shovelling, points manipulation and air brake application that (mostly) helped get the huge steaming beasts from one side of the country to the other. It was a glorious time by all accounts, but it was also 100 years ago. A couple of weeks ago I had the fortune to ride on a train, which unusually for me, was not run by part of the First Group. The geography of my abode means more often than not I find myself on board a "First Great Western" heading into or out of London via such places as Swindon, Didcot or Reading - but on this occasion I was travelling North/South via Bristol Temple Meads. What was particularly enthralling about this journey though was the quality of the train itself. My first shock, was that it was comfortable. I mean, good grief! Comfort! On a train? Whatever next? At this rate, they'll be having inexpensive wifi connections! And Lo, there was inexpensive wifi! That worked! I was mightily impressed for the best part of 5 minutes. And then I made use of said wifi to read about wifi on trains.... Where-upon I was mightily annoyed. It appears that wifi on trains is reasonably commonplace in the UK in the early part of the 21st century. Whereas wifi on what remains of the ground breaking Mr Brunel's Great Western Railway - in particular if its a first group train - remains well and truly non-existent. Of course I'm a bit of a geek and a bit of a nerd, so that's part of my reason for wanting a decent connection, but not only that, it's just the 3G coverage is appalling. God knows how bad 4G will be when it gets here - if the telecoms companies can't even get 3G right. P.P.S. By the way, I am still alive, and still trying to resume normal blogging service, but sometimes life just gets in the way. There's much to tell, and I promise I will dear reader - just as soon as I can stop running around like a member of the Olympic 800m, headless chicken, in a spin dryer, on a roundabout, strapped to a gyroscope, in geostationary orbit, revolving around the sun, team!... And other spinning places.